1991 Sands Regency XIII 9-Ball Open . June 9, 1991 . Reno, Nev. The Railbirds at professional tournaments might have been a few feet farther away from the table than back at Johnny Archer's home poolhall in Georgia, but the chatter could be heard just the same. "He can't win the big one," they'd say. "He's got the talent, but where's that champion's heart?" 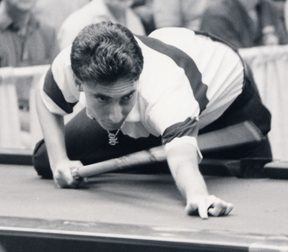 Before the 22-year-old won the Sands Regency 9-Ball Open in 1991, Archer had plenty of top-five finishes in his four years on the Men's Professional Billiard Association tour. He also had his share of doubters. "I heard them," he said. "And it was true. I tried not to think about it, but it was in the back of my mind. I started wondering if I'd ever win one of these things." And the one he finally snapped off wasn't a gimme. After the WPA World Championship in Las Vegas a week before, 20 international stars stuck around to enter the Sands Regency, ratcheting up the degree of difficulty a bit. Still, Archer breezed through the winner's side of the 98-player bracket, besting Jim Rempe in the hot-seat match. Archer went on a tear after his sands win. Rempe then overcame an 8-0 deficit against Nick Varner for an astonishing 11-9 comeback victory. He'd be the last obstacle between Archer and his first big one. After a grueling final that lasted more than four hours, the kid who couldn't come through in crunch time had plenty of ammunition to quiet all the naysayers. And the winning didn't stop there. Archer kept rolling into 1992. He won his first WPA World 9-Ball title, the International 9-Ball Classic and took another Sands Regency event for good measure. BD's Player of the Decade in the 1990s, Archer never forgot the importance of his breakthrough performance. "That really made all the difference," he said. "I was so much more comfortable after showing myself that I could win."